Bill Bird carves a boot tree – something that will double the life of the footwear. Buying a pair of handmade shoes or boots is an investment. You can double the life of your made-to-measure footwear by buying a bespoke shoe or boot tree. Hand crafted by the bespoke orthopaedic shoemakers at Bill Bird Shoes in the Cotswolds, the shoe tree replicates your last – the wooden blocks around which your shoes are made. The shoe tree is easy to get into and out of your shoes. Every time the shoe tree is placed back into your shoe it reforms it, taking it back to its original shape. This helps avoid creases forming over the vamp, the front of the shoe or boot, keeping them smooth and new-looking. Shoe trees from Bill Bird Shoes cost between £120 – £140 and boot trees start at £300 and are made from either beech wood or aromatic cedar. 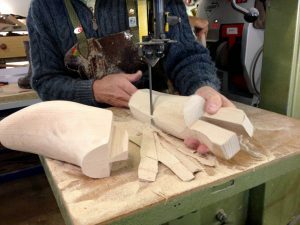 If you would like to find out more about the handmade shoe and boot trees from Bill Bird Shoes in the Midlands, please get in touch. You can email or call us on 01386 700855 and we look forward to hearing from you.